Using the MokiTouch app, an iPad, and an enclosure from iPadEnclosures, Fanzz mounted iPad kiosks at strategic locations throughout the store. The MokiTouch app gives Fanzz the capability to lock down the iPad to display only the Fanzz.com website, creating a secure kiosk experience for customers. MokiTouch also allowed the iPads to be locked down with custom security profiles - including disabling the home button and clearing private data - to protect kiosks from misuse and exposing personal information. MokiTouch also enabled credit card swipe using a headphone jack mounted reader secured by the enclosure. Using MokiManage, the Fanzz marketing team manages the kiosks remotely, updating the content and monitoring traffic and also uses the custom buttons feature to highlight current promotions and select more popular product categories at each location. 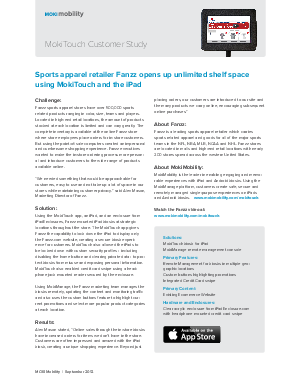 Using the MokiTouch app, Fanzz mounted iPad kiosks at strategic locations throughout the store. The MokiTouch app gives Fanzz the capability to lock down the iPad to display only the Fanzz.com website, creating a secure kiosk experience for customers. MokiTouch also allowed the iPads to be locked down with custom security profiles - including disabling the home button and clearing private data - to protect kiosks from misuse and exposing personal information. MokiTouch also enabled credit card swipe using a headphone jack mounted reader secured by the enclosure.